Temporary hearing loss can sometimes also be referred to as temporary threshold shift and can occur when a person has been subjected to a constant loud noise (usually in the range of 75dB to 80dB) over a period of several concurrent hours. A sufferer will usually experience some amount of hearing loss within the first few hours of being in close proximity to the noise – the hearing loss will not usually worsen if the sufferer continues to be in the same noisy environment. Once out of the noisy environment, a person suffering with temporary hearing loss will experience a lack of hearing akin to the sensation of hearing muffled or dull noises. A consequence of this is that it will often be necessary to increase the sound levels on a TV or radio in order to compensate for the loss of hearing. 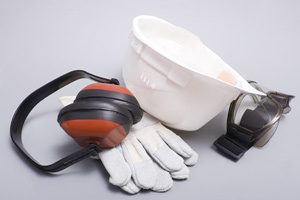 However, it is recommended that if a person believes that they may have a temporary loss of hearing due to prolonged exposure to loud noises in the workplace, the best course of action is to take refuge in a quieter environment until the symptoms recede. This can take anywhere up to 15 hours in some cases. Often if a sufferer of a temporary loss of hearing can allow their ears to recover sufficiently for a long enough period, there shouldn’t be any permanent damage to hearing. Although if there is prolonged hearing loss over time and insufficient time is allowed for the symptoms to lessen, this could lead to a permanent loss of hearing.